Notes: Lucy moves in with her kids just as Curtis arrives from Hawaii. He is upset at what Lucy did to the store while he was gone. Lucy makes a mess when an industrial size fire extinguisher malfunctions. Curtis moves in with the family. Notes: John Ritter stops by the hardware store and, after a series of painful mishaps, ends up staying at the family's home. Lucy accompanies him to a play he is appearing in. Notes: A building contractor, Ben Matthews, comes to the M&B Hardware store to talk about a contract for the store to supply plumbing fixtures. Notes: A hardware superstore opens near M&B Hardware, causing business to drop off. When Fred Dunlap, a talkshow host comes into the store looking for a Washer Hose, Lucy comes up with an idea to feature Curtis on his show. Notes: Lucy discovers her old saxophone in a trunk in the basement, while getting things for a yard sale. Notes: Lucy and Curtis are taking inventory at M&B Hardware, which proves to be a burden. Lucy decides to lease a computer to speed up the tedious inventory process. Notes: Lucy accidently sales her grandson Kevin's teddy bear during the family yard sale. The woman who bought it holds the bear for ransom and Lucy takes the greedy person to small claims court, representing herself. Notes: Ted and Margo's tenth anniversary is coming up and Lucy suggests they renew vows at a wedding she had planned. But Lucy's sister Audrey arrives and tries to take charge. Notes: M&B Hardware is burglarized, but instead of a Guard Dog to protect the store, Lucy gets a Guard Goose. Notes: Lucy and Curtis get trapped in a tree house after they overhear Margo and Ted discussing how Lucy and Curtis are spoiling the kids, and they decide to move out of the house. 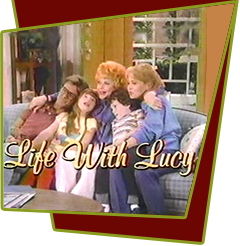 Notes: Lucy makes a distasteful health drink that the family dumps into a houseplant which then grows huge. Curtis wants to market the drink and schedules a press conference but Lucy forgets what she put into the drink. Notes: Curtis decides to retire and Lucy decides to buy out his half of M&B Hardware. Lucy has everything on sale and realizes she has spent more on promotions then she is making and decides to find a partner. Curtis bored with retirement interviews for the position. Notes: Kevin wins a trophy in Soccer and the family all displays the trophies they've each won, except for Lucy. Feeling sorry for her, Becky enters Lucy in a talent contest for grandmothers at her school. Notes: As Curtis is struggling to put together an artifical Christmas Tree, the Family decides they prefer an old-fashioned Christmas. Everyone agrees to spend a weekend in a ski cabin in Colorado as this would be a great way to spend the Holidays and a chance for a White Christmas. They soon become stranded due to the weather and return home to find Santa had put up a real Christmas Tree.